A properly maintained machine reduces air consumption and extends the life of the unit. Prerequisites: Air supply : 75 to 85 psi (5.5 bar) – Electrical : 110-240 vac (option). *Lubricate the high speed handpieces daily on the second larger holes and operate the handpiece for 10 seconds. The low speed handpiece can be broken down into three parts. Disassemble the three parts, lubricate the second larger holes, lubricate both ends of the contra-angle and finally lubricate the prophy-angle. Once this is done, re-assemble and operate the handpiece for 10 seconds, then wipe clean the excess oil on the exterior of the handpiece. Empty the humidity filter by opening the drain at the bottom. Use a cloth to avoid getting wet. Empty the oil filter by pushing the valve at the bottom. Use a cloth to avoid getting wet. Unplug your compressor at the end of the day and drain all pressure by loosening screw* below air reservoir. This will also eliminate condensation and prolong the life of the reservoir. DON’T FORGET TO tighten the screw before starting your day. Listen for unusual compressor start-ups. 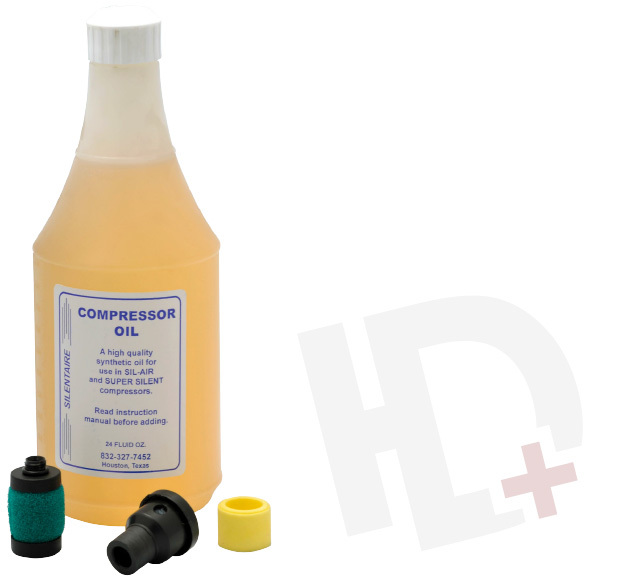 If the compressor starts occasionally when not being used, it is a sign that there is a leak in the system. If this situation is frequent contact the manufacturer for assistance. If the oil level is less than half, Fill the reservoir slowly by pouring a small quantity of oil at a time. Wait 5 minutes and check the level. Do not fill more than half. Remove and clean jar if you notice any buildup of oil. Verify the pressure of the handpieces (with the exception of the Piezo) and adjust, if necessary. Manufacturer’s guidelines can vary, but the pressure should be set to approximately 30 psi for low speed handpicks and 40 psi for high speed. An annual preventive maintenance is recommended. The maintenance consists of replacing all filter elements, changing the oil in the compressor, checking for leaks, resetting pressures, and completing performance analysis. Contact your Highdent™ supplier for further details.